Very handy if you have twins and don’t mind one not seeing what’s about but I didn’t like only one can only see what’s going on and the other just see the back of the chair. 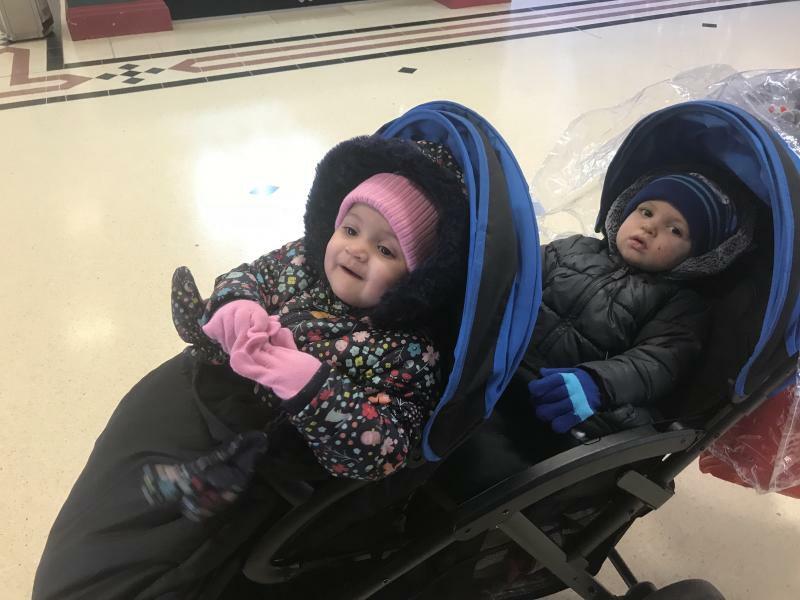 This double stroller is fantastic, the best thing I have bought, it has made life so much easier. I use daily with my 6 month old and my 18 month old. It is sturdy yet lightweight and super easy to fold. 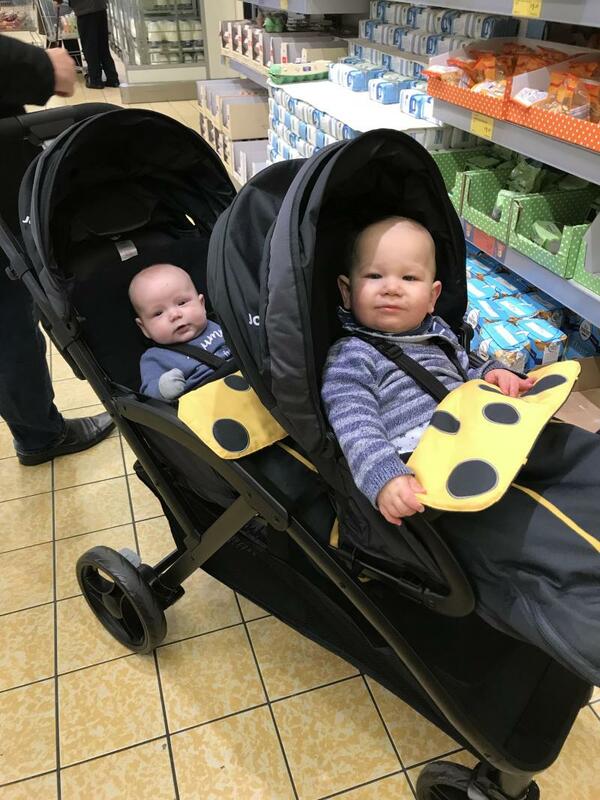 I had to buy a double buggy for when I had my son as my daughter was not yet two. I researched and this one had the best reviews. I bought it second hand as brand new it’s a bit pricey. When I first got it I thought wow this is huge I’m 5ft2 how am I going to push it but you get use to it straight away. We don’t have a car so we walk and get the bus everywhere and I was very nervous about trying to fit in the slot on the bus but it’s a perfect fit but if the driver is a bit moody and there’s already a pram on he probably won’t let you on. When it comes to folding it’s easy enough but it’s still quite bulky when folded. This is one of the most light weight prams I’ve had. It folds great with one hand and easy to open up again. When folded can be quite bulky. I find it light which is great for two babies but difficult when steering as most pavements are slanted. You often feel as if it’s going to tip to one side. The back seat reclines well for a new born but doesn’t sit up completely and the front seats has 2 recline positions with very little difference which is not great for nap time. I love it . I have a 6month old and 3yr old and i love the options for this stroller. Price is good too. Lots of room as well which is always a bonus. The reclining was an issue for rest time for 6month old . 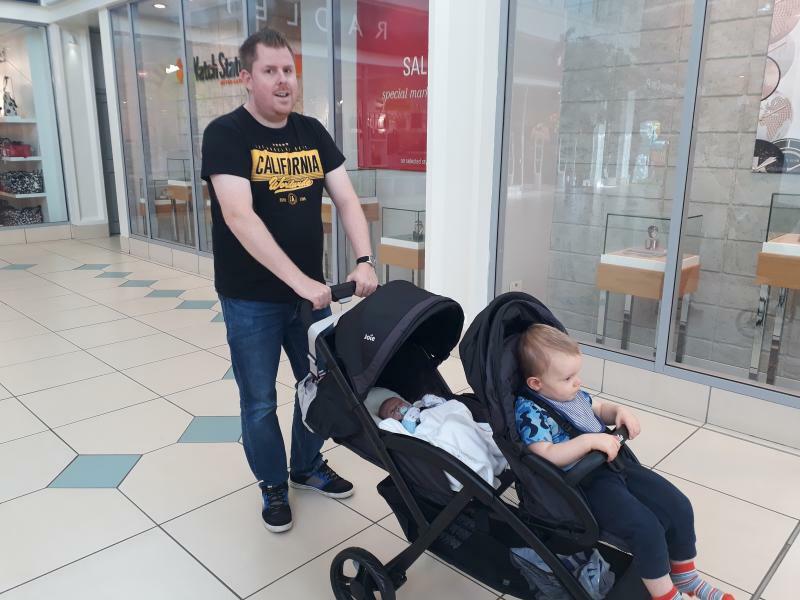 We had to get a double buggy as we have a 6 week old and 20 month old, we didnt want to spend a fortune on something as we know our toddler will want to walk more and more but still have a rest now and then, we CANNOT fault this buggy, it's amazing!! Highly recommended to other parents in our situation. I opted for this double pram as it was one of the cheapest i came across. 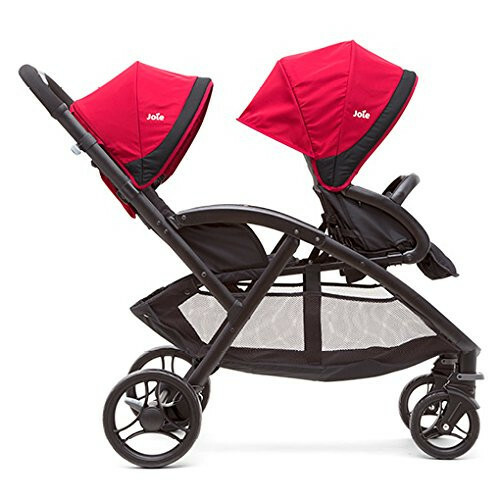 As i required a double pram for a short period it was great i could find one so inexpensive. 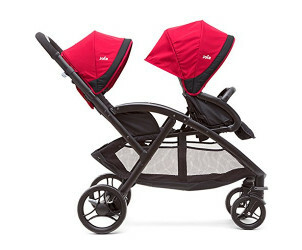 It is very lightweight (until my daughter is in the front) , its a great push, nice and quiet. It has a very large shopping basket which i need on a daily basis! You can fold using one hand! Also comes with rainvover. The only downside to this pram is the front seat doesn't recline so if my kid falls asleep her head flops so she can't sleep in it for long. This product was a great buy for my 2 year old and new born baby, however it would have been ideal for the front seat to recline a bit more for when she falls asleep. My oldest daughter now 2 and half and is a bit harder to steer with her on the front seat but ok if she is in the back and my 5 month old is in the front seat. The basket on the bottom is huge though and great for shopping and days out. Lots of storage underneath. Easy to steer. Lightweight and easy to fold. This has been prefect for my newborn and 2 year old. It's been really easy to steer. It's easy to fold, managed to do it with one hand. At first glimpse it felt great. But then put a 2 year old and new born plus the car seat and it's awful. Hard to steer and feel like the pram will fall over on a un even surface. My son is by no means tall for a 2 year old but I can't put the hood over him as it won't go over his head! Disappointed to say the least. Not recommended! Very good buggy, easy to steer, lightweight, easy to fold, very big basket. Downside is that the front seat doesn’t lay back, break can stick and wheels lock in. Also makes a clicking sound when you turn a sharp corner. 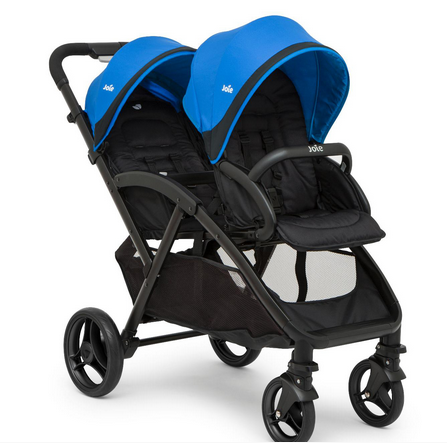 Great lightweight double pushchair. I had this for my newborn and just turned 2 year old and although it was so light with just the baby in, it was hard to push with my 2 year old in the front and the seat is very small. Basket is great and plenty room for babies stuff/shopping etc. Good size hoods, only major problem is that the front seat does not recline much so child’s head falls forward if they fall asleep. But overall a good pushchair for getting out and about. The basket is large which is great to hold shopping in. I have this for my 2 boys one is 2 and half and one is 3 weeks. It is easy to push, large basket, and very sturdy. Can have the joie gemm car seat on it too. One Rain cover to cover both seats. I cant wait to give birth to may second child and to tray this with him and my first child David.i m so happy and i hope that this will convince more people to try this wonderful pushchair. Not very useful if you have a active toddler. Rear seat would be uncomfortable for a ever moving toddler and it will be difficult to steer if the toddler is in front. I had this pram and unfortunately needed to change because of broken breaks. Shopping basket can take a weekly shopping. Not to easy to drive over curb. The front seat could be open to lie down more. Really quick and simple folding, folds flat for easy storage. Can be hard to steer round corners, especially with toddler in the front, only back seat lies flat. This buggy has been a Godsend! My two year old likes to wander off and run away when we are out and found myself having to abandon the pram to chase after him, with this i can just strap them in and not have to worry about my son running off. He loves it as well as he's higher up in the buggy than with a normal pushchair. I have used this since my little girl was a week old its great for a new baby and toddler, didn't have to buy the car seat attachment as it lies flat at the back. Simple to fold, can do this one handed and really compact so easy to store if your struggling for space. I think over all this is a great buggy. Easy to push and steer, doesn't feel like I'm pushing 2. It could be made better if the front wheels were doubled up to make it stronger and if the front seat may back a bit further. I had this for my newborn and 2 year old it was just what I was looking for not to heave strong one handle and baby’s seat reclined. 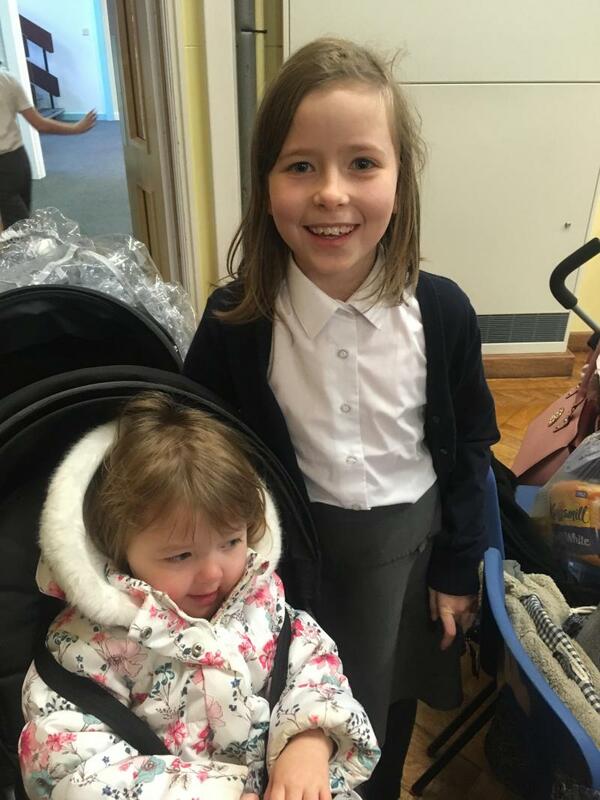 It served me well until my oldest got to about 3 and she got too heavy and big for it and that made it difficult to push apart from that’s its good value for money. Huge shopping basket, big hoods, padded seats good wheels the only downside is the front seat hardly reclines it might as well not. Can be hard to fold sometimes and the front seat doesnt recline much. I love this pushchair been using it for 3 months and would recommend to anyone that is out and about a lot, especially in public places ect. The pushchair fits through doors perfectly and i can get it on and off public transport easily. Folding can sometimes be a bit tricky but once folded nice size for car boot. Huge shopping basket much needed and such a bargain price! I loved this pram on first sight. Steers great the kids are comfy and great first use. Until went to put the pram away and the wheel fell off. Shame because I loved the pram and paid a lot for it. Also the back seat doesn’t sit fully up meaning baby is constantly trying to pull himself up. Not impressed at all. This double buggy has loads of space in the bottom compartment so worth a buy if you take a lot of stuff out with you. It was relatively east to steer and light to push considering it was a double buggy. For the child who occupy the back seat there is loads of space and can be sat up or layed down. 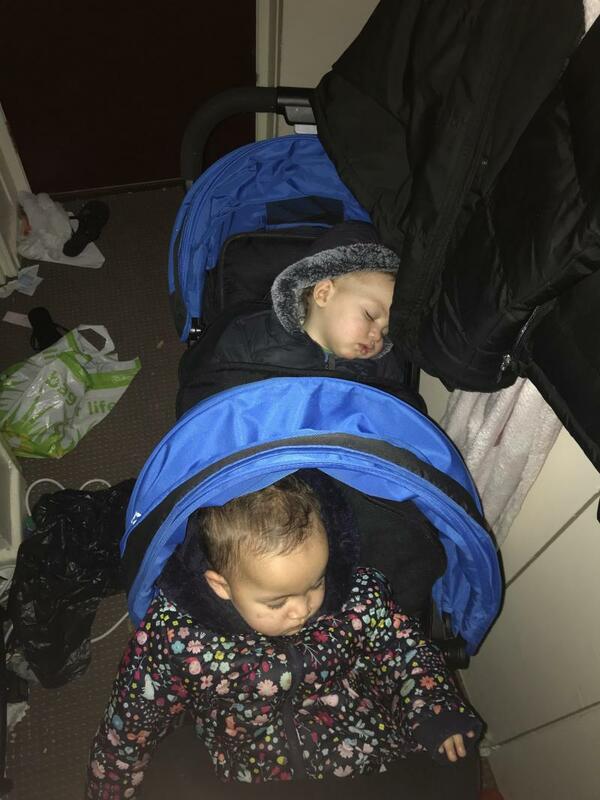 My issue with the pram was the front seat didn't recline and my two year old still had midday naps therefore she was uncomfortable and often woke with a sore neck and also can be quite long for small spaces on buses. 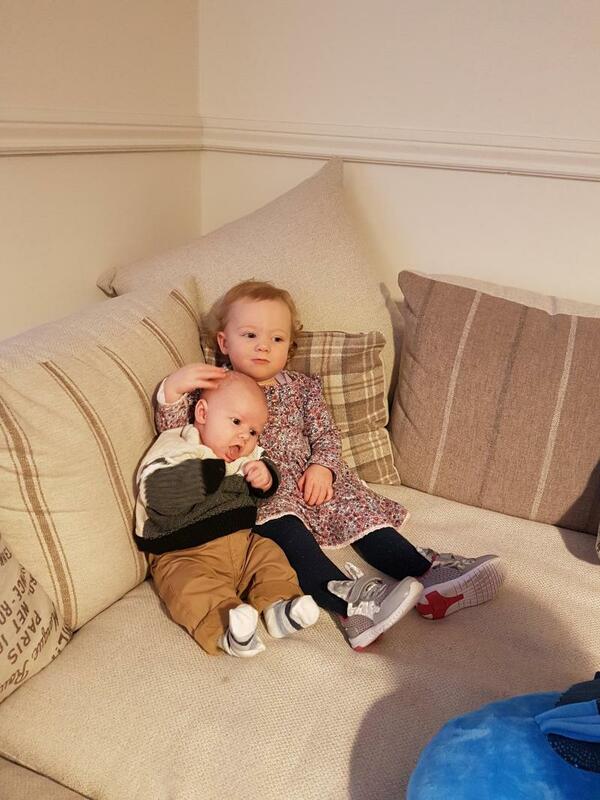 I have 2 under 2.really helpfull, easy to use and light,only thing is it's only ok till 15kg per child,my 18m old is 15kg already so won't be able to use it much longer which is the shame,but otherwise happy. Excellent buggy for my newborn & 15 month old, i can fold it down quick & put it up quick, fits in my boot which isn't that big! Double the trouble, double the work, but way more than double the fun!! The Evalite duo from Joie will carry all your luggage and lighten your load. Whether you have twins, or a newborn and toddler, this dynamic duo solution will work for you and make every trip out twice as nice. This is one of the lightest weight double pushchairs that you can buy, at just over 10kg. Even when folded, with one hand, it will be compact enough for small car boots and will stand on its own. Large shopping basket, so your trips out aren't limited, and even shoe-saver breaks - Joie have really put some thought into the design. So it's practical. What about your mini passengers? They can expect the high quality and comfort we have come to expect from Joie. Soft touch harnesses, comfy seats and full suspension providing a smooth ride in this tandem piece of engineering.